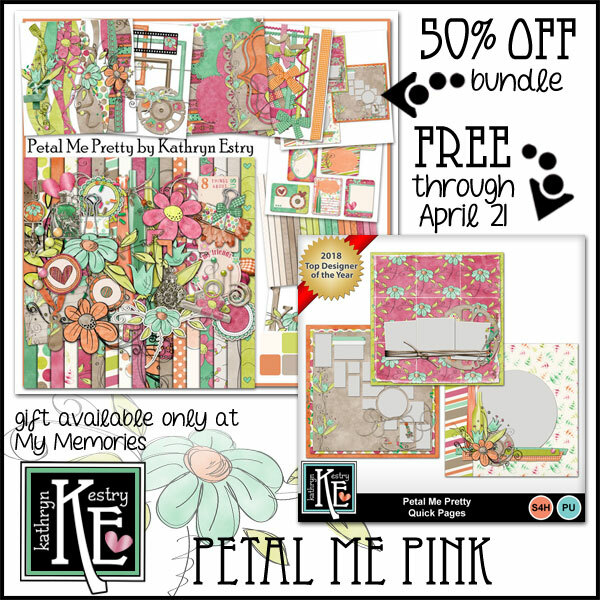 I have FREE for you this week not one gift, but 3 - beginner-easy quick pages created with Petal Me Pretty. If you like this gift, please consider the full bundle on sale for 50% off. See my entire MyMemories store HERE! Click HERE and use coupon code STMMMS81177 to get a $10 discount on the purchase of the My Memories Suite scrapbook software! You'll also get free bonuses when you check out! Lovely kit and freebie! Thank you! This is so pretty!!! It would work well for scrapping not only spring photos, but for some of those more "retro" photos!!! Very pretty! Love the hand drawn flowers! Thank you for the freebie. Thank you for the lovely quick pages to this gorgeous collection.